Home » Hair » L'Oreal Hair Chalk: Temporary Color can be so fun! L'Oreal Hair Chalk: Temporary Color can be so fun! 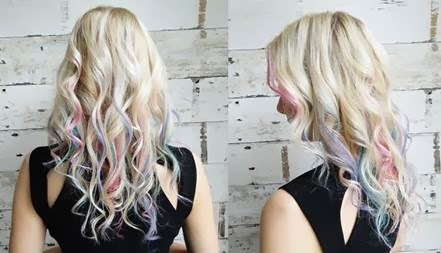 L’Oreal Hair Chalk created By Senior Stylist Caitlyn Young of SalonCapri, Boston. 1. First, begin with dry hair. 2. Start by using the L’Oreal Pressionnel Hairchalk and brush or rub pigment onto hair in one inch pieces. Try focusing the color onto the ends of hair for a gentle ombre effect. 3. Next, comb through your hair to evenly spread the pigment. 4. Finally, blow-dry pigmented area on a low setting to set the color. 5. To style, curl your hair using a two inch curling iron and set with Kerastase Resistance Double Force Hairspray. 6. Brush out curls to create a loose wave and braid hair, securing the end with an elastic. Use clear elastics to blend in with your hair and new colors! 7. 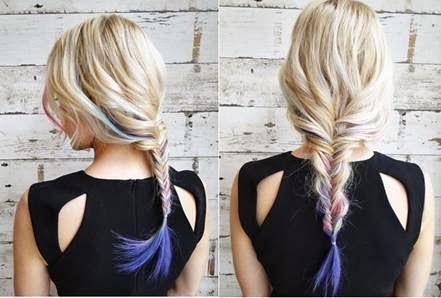 Using fingers, gently pull at your braid to separate pieces so that the colors show through!